Finally I have made this gravy, and the reason behind this is my sweet angel. whenever I ask her what she wants for dinner immediately she will tell kofta and chapathi.She has been saying this for atleast 3 months ,becoz once we both were seeing Raks kitchen, where she has posted cauliflower kofta's with lovely stepwise pictures , I said my daughter we will prepare this, so from that day it started -what is for dinner - Kofta and Chapathi. Pressure cook the potatoes, peel the skin and smash it. Clean the broccoli and grate it. Heat oil in a pan, add the grated broccoli, along with the garam masala powder, chat masala powder,turmeric powder,chilli powder and saute it for about 5 mins in low flame. Add the cooked potatoes, along with corn flour and salt. Mix them well. Heat oil in a pan, Make small balls of it and deep fry them until they turn golden brown. Drain them in kitchen towel to drain excess oil from it. Crispy delicious broccoli kofta's are ready. Chop the tomatoes and grind them in a blender to a smooth puree. Heat oil in a pan, add cumin seeds,crush and add the bay leaf, saute for a min. Add onions and saute until they turn translucent. Add the ginger-garlic paste and saute until the raw smell extracts from it. Now add the tomato puree along with the powders and mix it gently, keep stirring till the gravy thickens and the raw smell of the powder goes off. Add sufficient water , along with salt and allow it to boil. Add these Kofta's while serving. For Low fat/healthier version you can use paniyaram pans instead of deep frying. You can also add fresh cream, at the final stage for more richer taste. Great looking koftas, wat a best way to sneak broccolis,yumm! 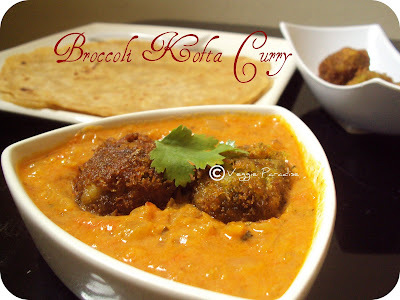 wow perfect dish n perfect idea to use broccolis..
perfect looking koftas aruna.. kalakitinga.. love this with rice..
wow its a awesome kofta...love this version...clicks are good..
WOW Aruna...never heard of broccoli koftas, but they look so good...for me koftas have always been either bottle gourd or spinach...got to try this one. 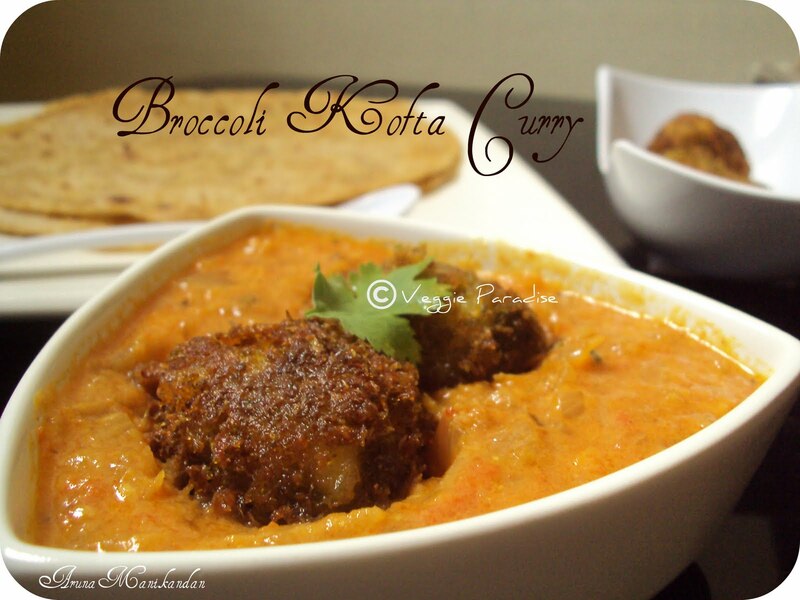 Yummy and delicious broccoli kofta..just need some rotis to dig in..mmm..YUM! Looks very tempting and delicious. Very Healthy and tasty recipe with Broccoli. Yummy koftas swimming in the sauce. Now my son has started it. Perfect and creamy kofta curry,looks so yummy. Brocoli kofta looks awesome dleicious. 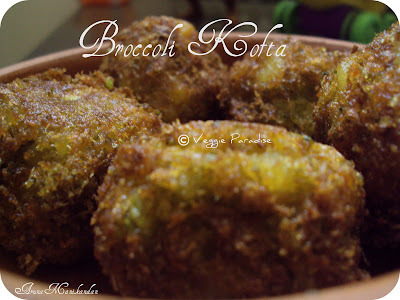 Wow..what a wonderful idea..broccoli koftas sure looks yummy...great idea dear. Wow.. wonderful recipe with broccoli... looks soo tempting..
super o super! What a yummy kofta -- Aruna - truly mouthwatering!!!! The kofta and gravy look so incredibly delicious! I love it! healthy n tasty koftas...first time here..u have wonderful blog..
Broccolis are very healthy.This is a very good option to have them.Liked the dish i which you have served them. that looks oh so good!!! totally yum!!! Wow so delicious and unique recipe..
lovely recipe dear...looks so inviting ! Hi Aruna, This is looking absolutely delightful. Very nicely made and presented. Its always fun to see ur appetizing recipes. Saving this recipe of urs and wud love to give ur version a try on the coming weekend. Have a great day !!! Sweety.. I have shared few awards with u ... please accept and collect them ! very yummy koftas, great way to use broccoli in it. Broccoli kofta very innovative...n luks very tempting and perfect...love broccoli in any way :) awesome pictures...glad to follow u...looking for more yummy recipes from u!!! delicious nice recipe...just right with chapatis for a wonderful dinner. Loved the Broccoli Koftas. Thanks for visiting my space. Sorry for the delay..was on a small vacation with family. Happy to follow u too.